The Lord of Animals, Pashupati, has decided to be the Knight of Disks. The greatest of all the gods has embedded himself in this maya. This great Being, for whom all is equal, whose consciousness spans the entire cosmos, favors this tiny corner of reality. It is after all the playground of his consort, the Goddess Parvati, the mother of creation. Shiva is always supporting her. He is the enjoyer and experiencer of her play. Together they are the benefactors of mankind and this earth plane. They have created it and they adore all aspects of it. Shiva and Parvati are always together. 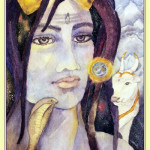 If you are looking for Shiva, you can find him with Parvati. You can find consciousness in matter. It is all alive. It is all cosmic vibration, all consciousness. Shiva is the hidden component in the material; he is what lays below the surface, the surprise we are here to uncover. We are the players of this game that he and Parvati are playing with each other. When you get this card, step back, reflect, meditate, move back into the perspective of an observer and see how you are playing out a reality that belongs to you. Meditate on how consciousness is providing you with the stage and setting to live out your experience. This might be a chance for renewed appreciation for life, more gusto for the game and a wink from your creator. 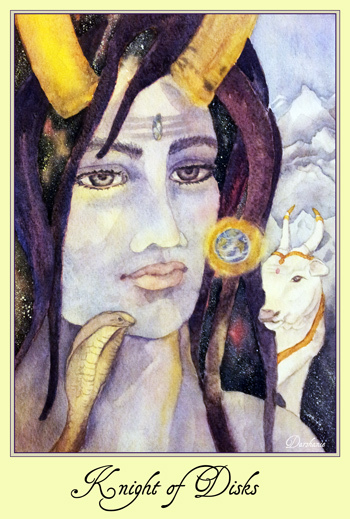 This entry was posted in Disks, Tarot on March 8, 2016 by darshanie.